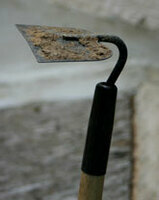 The hoe cutting tool used to stir and weed the soil. Most hoes are long-handled so the gardener does not have to squat or kneel. Hoes come in different lengths. Choose a hoe that you can use comfortably without having to bend too far. Different types of hoe cut different depths and some cut on the pull (draw hoes), some on the push (push hoes) and some on both (oscillating hoes cut on both strokes). Pushing requres more effort that pulling, so push hoes are better suited for lighter work. Unless you select a quality tool, hoes have a frustrating tendency to loose their heads. Avoid stamped-metal designs. Most hoe blades are attached to the shaft with a tang and ferrule joint. The quality of tang and ferrule joints varies dramatically. Although they can be difficult to find, the best hoes are joined with rivets. Dutch hoes, sometimes referred to as scuffle hoes, are push hoes. These hoes are very sharp and good for reaching inaccessible spots. The Eye Hoe is a powerful cultivating tool well suited to large-scale cultivation. The blade of an Eye Hoe is forged with hole (the eye) through which the shaft is inserted. This is a very versatile hoe and cuts deeper than other hoes.